I don't know why I do these things to myself. I kept saying that I was not going to be a guest participant in Linda's Calling It Home One Room Challenge, but here I am...jumping in with both feet, straight up to my eyeballs! Before we even closed on this house, I talked to you all about redoing the guest half-bath downstairs, and it would make sense that it would be the room I would choose for the One Room Challenge. I teetered between the half-bath and the second guest bedroom, but decided to go ahead and get started on the half-bath. While it is a small space, it will involve more than just pulling some furniture into a room. This bathroom is very tiny, only about 22 square feet. One of our main challenges will be fitting two people inside this room so that we can work! 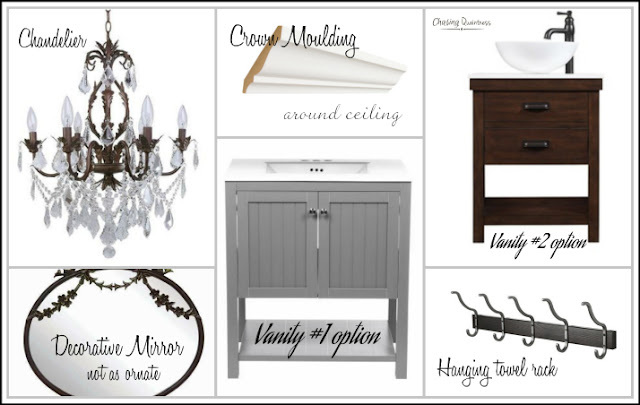 This is the inspiration board I pulled together for this project. I would love to find a vintage piece of furniture to use as the vanity, but the space is so narrow, I don't know if I can find one thin enough at a reasonable price. We are going to be on a tight budget for this room. I suppose I will decide right when it's time to paint it. Having a gallery wall in this space (similar to the one below) is still appealing to me, but that will be quite a few nails in a brand new wall....I'll be sweating it! Benita, I love your inspiration! I painted my living and dining rooms a soft gray a few years ago and couldn't get over how much brighter and larger it made the space feel. You got this! Can't wait to see your results! Thank you so much Cecilia! I love the softer grays and think they are just so pretty! But I also like the really dark grays…that’s why I’m so torn. We did some projects at our house in Texas, but never this much of an undertaking! I’m looking forward to it and thank you again so much!! Hugs!! I cant wait to see how it all comes together! We have our master bathroom painted in SW Sea Salt and its a gorgeous soft green/blue gray. Will be cheering you on and waiting to see what color to choose. 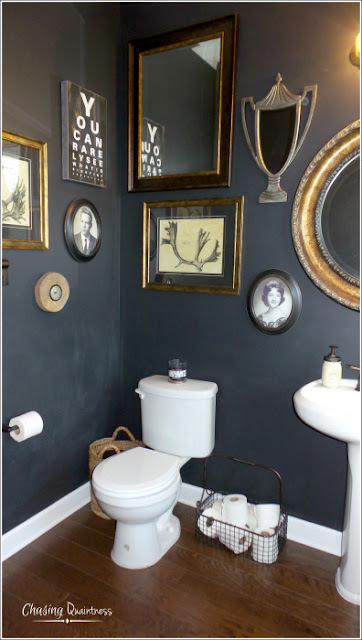 I love the dark wall look, but fear it is too dark for my home. Thank you so much! I was really leaning towards that dark color and thought it would look very dramatic in the space, but after standing in there with the hubster taking measurements this morning, I may be going with something light! I love your terminology....sounds just like mine! :-) And we have discussed those for some of the photos. If I end up doing a small gallery area in this room, that will be what I use...I just cringe at all the thought of all those nail holes to hang all the photos. Much love and hugs to you sweet friend! I am interested to see how the board and battan is all gonna fit in there to get it up!! I think it will be gorgeous. Thank you so much Christine! I'm excited also...there are 4 of us that I know doing this challenge...me, you, Stacey (Poofing the Pillows) and Stephanie (Casa Watkins). I can't wait to see the progress and the final result! And YES...cheering each other along...it's exciting!! Hugs!! i have ALWAYS loved board and batten. very cape cod new england to me... both of which i adore. Thank you so much! I have always loved it also. It is one of those design elements that remains timeless and works in any decorating scheme. I adore both of them also…I fell in love with Maine and Rhode Island when we traveled there this summer! I could have stayed forever! Much love and hugs!! Thank you so much Julie...I will definitely appreciate all of the encouragement and may have to have help in the decision making process along the way! :-) LOL @ you go girl.... I say it all the time....it works for me!! :-) Hugs!! You got this girl. I know it will be beautiful. Thanks so much Kris…you know, you guys could always visit Gallatin and you could come help me! ;-) Hugs!! I love doing bathrooms---I am the queen of shower curtains and rugs...I love to switch them out according to my mood and I get a whole new feel. But power rooms are a little more difficult because when it's done...it's done! Well, new artwork and accessories can give it a little punch when you're bored!! I love redoing bathrooms also...they are such a small space and need all the boosting they can get. Changing out a few things does help. 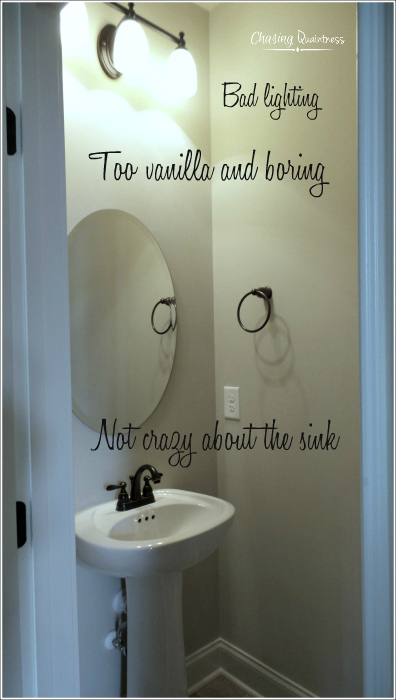 And you are so right on the powder rooms...one and done. 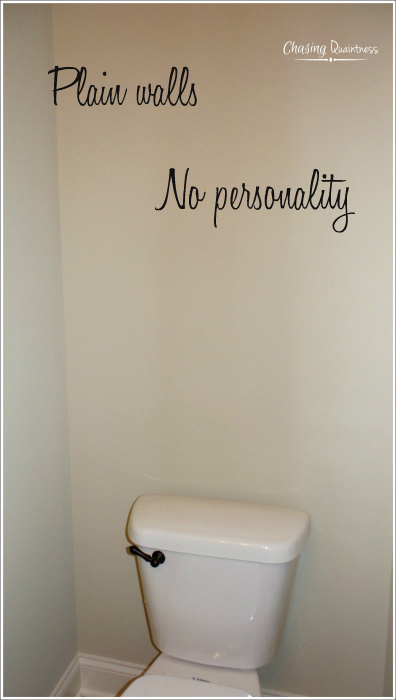 It's hard to find artwork for a powder room, at least it is for me. I never know what sort of feel I want it to have and change it up frequently. Thank you so much! I do love the board and batten because it is timeless and requires no updating for a while. I'm short also...5'2"...the hubster is 6'2", so we have to find a happy medium. We think 36" tall will work for both of us...I definitely don't want to have to stand on a stool to wash my hands...LOL Hugs!! 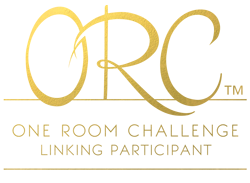 Looking forward to seeing your room challenge! It is probably a good thing to do thechallenge because it will make you finish a project that you have been wanting to do anyways! Can't wait to see how it all comes together! I know it will be gorgeous. We did the SW Sea Salt in our lower bath redo...it works really well with browns and white! But I do love that dark gray you chose too! It's a small room, I say go bold!! 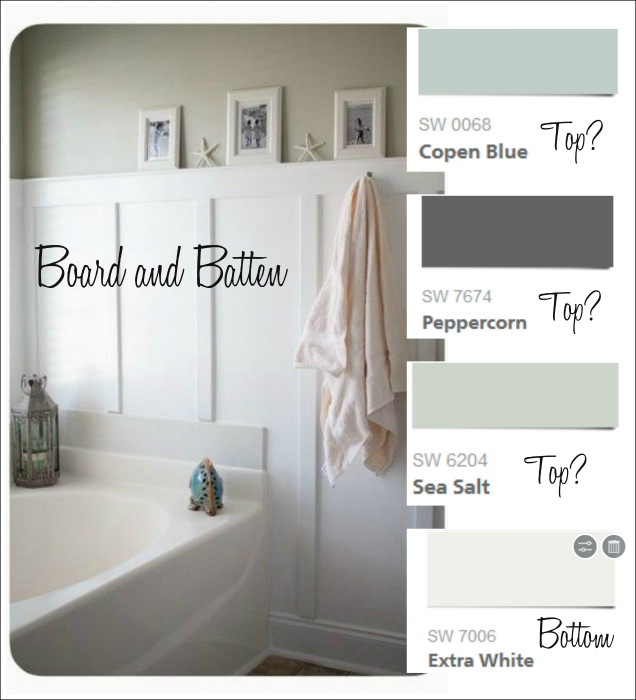 The white from the board and batten will keep the dark gray toned down and not too dark in there! Hi Kimberley, thank you so much! I like the gallery wall idea also...mine might not be that busy or by the time I get to that point, I may be so disgusted with it, that I will just throw something on the wall and call it finished...LOL. You know how frustrating some projects can be. I've been looking at the command strips as alternatives because I just really don't want to have a wall littered with nail holes. The dark, dramatic color is what I'm really leaning towards. I will know more once I get the board and batten up and the painting finished on the bottom part of the wall. Thank you so much!! Hugs!! Thank you so much Dee and Happy Monday to you too! :-) I think that squeezing both of us into that tiny space will actually be the biggest challenge of all in this project! I’m looking forward to getting it completed though! Thanks again!! Hugs!! I like those shades - can't wait to see more. Thanks so much Jan! Hope you are having a great day! Thank you so much Rhonda. This is the first time to really tackle a project like this and I'm hoping for easy and not to frustrating! Hugs!! Awww, thank you so much Jemma! I appreciate your confidence in me...but you've seen my craft projects, right?? ;-) Hugs! !